What an amazing, uplifting movie. I loved it! It made me feel like cooking. Of course, you'll feel that when you watch it. You'll want a taste of whatever they're having because it looks so delicious. However, it will look sometimes something foreign you're not used to. It did to me. I watch and I go like but this is so unconventional for us living in this part of the world where rice is to be had every single day, or at least the majority of the days of the week. I'd love it if we had new things, tried new things, cooked new things but sometimes I'm not brave enough to order something new so how can I even think of cooking something new when my cooking is still undergoing major construction works? Yet, I'll try to be unconventional once I master these dishes mom could make with her eyes closed while I have to be satisfied with something less hearing her encouraging words that I'll get there. It's just that being responsible for feeding people is really exciting. Scary, and sometimes even mixed with guilt due to the fact that they have to eat what I'm cooking, though there has never yet been a case of utter failure. Everything I've cooked has been eaten thankfully, so even though that might not say much, could be simply that I'm not being daring but it's still something. Or I think it is. Anyhow. Watch the movie. You won't be disappointed. 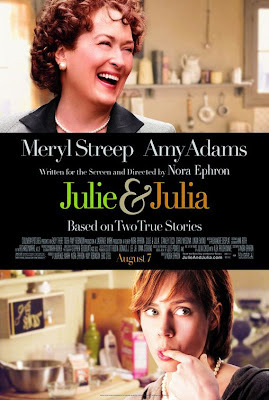 Meryl Streep is beyond marvelous! "I just want to savor this moment. The moment when anything is possible. The moment that you can just imagine they're going to love everything you did and it's going to sell a million copies and change the world." PS: I watched it alone. That's like a first!